I have decided to start a new series; titled TUESPO (Tuesday & inspiration), which will be featured on Tuesday's (stating the obvious). The first of this series is " The Modern Uniform". It was inspired by the new Topshop Collection with Karlie Kloss. When the words "The Modern Uniform" are used, what do they mean. 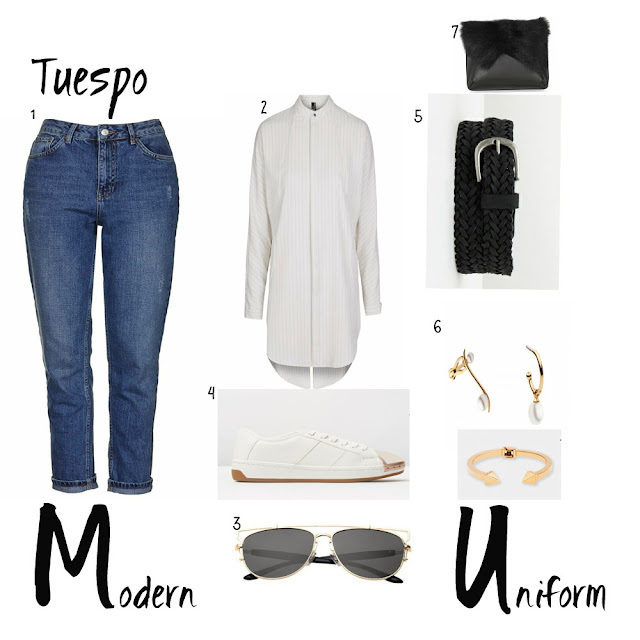 Its simply the mixture of androgynous workwear staples (The Classic White Shirt, Jeans) with the quintessetial fashion pieces ( The trench, biker/leather jacket), add a little pizzaz!! With the accessories, for a forever cool look. I love this look because it suits my style but a little dressed up. 7. Premium Shearling Clutch (Topshop). P.s: Happy Australia Day to my Australian readers. Definitely my style loving this !